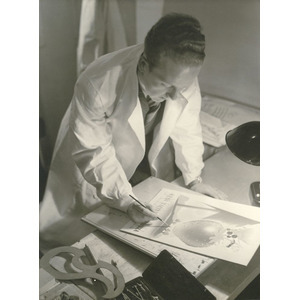 The advertising expert and poster artist Jorma Suhonen is one of the most acclaimed commercial graphic designers of the 1930s. In 1934, he founded the advertising agency SEK together with Holger Erkelenz and Aarno Knuus. The three young men had completed their studies at the Central School of Arts and Crafts the same year. It was clear from the beginning that Jorma Suhonen was to be the newly-founded agency’s leading poster artist. In 1933, he had won first prize in the poster competition Scandinavian Air with a poster made for the company Oy Aero Ab. 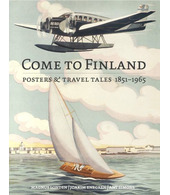 This success continued between 1937 and 1948, when Aero ordered several posters from SEK and Suhonen. Commissioned by Suomen Matkailijayhdistys, the Tourist Society in Finland, Suhonen also made a series of posters about the island of Suursaari (Hogland). Unfortunately, this set of posters cannot be found anymore. In the post-war period, Suhonen also made a significant contribution to the National Relief Fund (Kansanapu) by his posters that urged people to be economical and show solidarity. Freely translated, they read ‘Help with what you can’ and ‘Open up your heart. The National Relief Fund awaits your gift’. From 1942 to 1950, Jorma Suhonen also taught graphic art at the Central School of Arts and Crafts. After having left SEK at the end of the 1940s, Jorma Suhonen began a new career at the Finnish Foreign Trade Association (today Business Finland). He also worked as a graphic designer and was responsible for planning exhibitions of Finnish work abroad. In 1977, he was granted a state art pension.